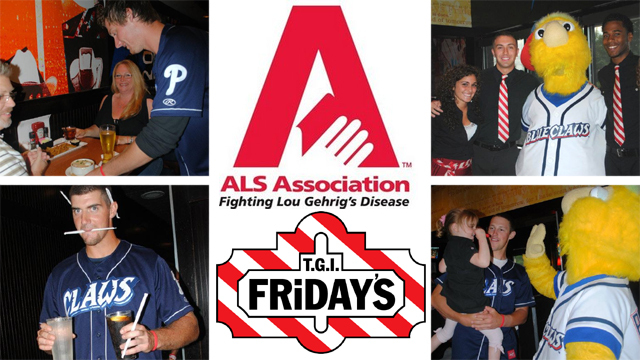 LAKEWOOD, NJ - The BlueClaws are proud to hold their 14th annual ALS Celebrity Waiter Event on Wednesday, June 4th at TGI Friday's on Route 70 in Brick. This marks the third straight year the event will be at TGI Friday's in Brick. There will be two seatings: one at 5:30 and another at 7:00. As in years past, BlueClaws players will be serving as the waiters, and coaches will serve as bartenders. "This has been a wonderful partnership between the BlueClaws and the ALS Association over the last 13 years and we are looking forward to what is always a great event," said Jim DeAngelis, BlueClaws Director of Community Relations. "The Phillies and their family have raised money to fight ALS for 30 years and here at the minor league level, the BlueClaws have been able to do the same since our inception in 2001," he added.